Outsourcing your IT to a managed IT service provider is the most cost effective way you can keep your systems up to date and stay on top of evolving security threats. We offer a range of managed IT services to keep your infrastructure and systems operational and secure. When working with you, we take on board your system usage, size, the way you do business and your budget, and create a managed service package around how you want to work. Of course, no matter how big or small your business, with our IT support services, we proactively review your security, infrastructure and system performance and let you know if there are any areas of concern, or network improvements. In addition, as a Managed Security Service Provider (MSSP), we’ll focus on prevention, and then monitor and detect threats to your system in real time, taking immediate action when required, while keeping you informed to protect your business. 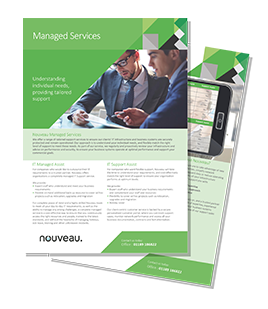 Download our brochure on Managed IT Services. Our primary focus is to provide Managed IT Services that enable you to focus on your business without having to worry about your IT. However, when you do need extra support with day-to-day IT issues, our service desk staff are on hand to respond quickly with high-level expert advice. Our IT support services are flexible, so you can choose the Service Desk coverage that’s the best value for your organisation. For example, if you only require office-hours support, there’s an option for you, or if you need round the clock, 7 days a week support, you can have the option that gives you the level of managed IT support your business needs to operate at maximum efficiency. Our SentinelOne Endpoint protection service continuously monitors all your employees’ work-related smartphones, tablets and computers to protect your business no matter how or where your teams need to work. We begin with a full endpoint audit of all your devices, checking for software versions, latest security patches and existing issues. Then, we’ll install our security agent on all your devices – this can be done remotely with no disruption to your working day. From that point onward, our security experts continually monitor all devices for threats, and act immediately if any suspicious activity is detected. We provide a managed Security Information and Event Management (SIEM) service that constantly monitors the integrity of your entire IT system, and creates an alert if any potential weaknesses are detected. With a strong focus on prevention, we continuously monitor your security compliance status to reduce the chance of a security breach. You’ll receive regular, detailed reports on the status of your systems, and notify you of any action we’ve had to take as a result of a detected threat. With GDPR, not only do you have to ensure your employees’ and customers’ data are safe, if you do experience a security breach, the fines are huge. It’s never been so important to proactively safeguard your IT systems. As managed IT service providers, we’ll make sure you are GDPR compliant, and then monitor your systems on an ongoing basis to ensure you are maintaining the level of data security you should. We also help you manage your ISO 27001 commitments, so you can keep your clients’ data safe and retain your certified status. We ensure your existing security hardware is keeping up with the changing threat landscape with annual Firewall Health Checks. Your firewall is the most critical part of your organisations’ defence against malicious activity and increasingly sophisticated cybercrime. At Nouveau, we manage your firewall, making sure it’s always optimised and up-to-date to guard against the most recent advances in security threats. We’ll set up and proactively monitor your firewall, automatically applying any security upgrades that you might need. We’ll assess the integrity of the firewall within your wider IT security landscape, ensuring it remains effective as your organisation changes. Being responsible for IT in an organisation which is very tech dependant is a real challenge, especially having no formal IT experience myself. Having the Nouveau team at the end of the phone is a real-life saver and I have needed a life line many times. I most appreciate the accessibility, knowledge and friendliness of the team. I have nothing but praise to offer for Nouveau Solutions and would highly recommend them to any company that was looking for an IT services company. There are definitely no plans here to switch to a different IT services company for the foreseeable future. Here’s too many more years with using Nouveau Solutions! Just wanted to say how impressed I have been with the out of office support from Daniel. We had a full power outage and several issues occurred due to this, the expertise and support from Daniel was superb. As always you can depend on Nouveau to pull out all the stops and save the day. Thank you and look forward to working with you in the future.